Yesterday, I went to the health club to lift weights as planned since the wind was to be blowing and blow it did! Tonight, I got on the water at 15:43 hours and the temperature was 63 degrees. The wind was still quite strong and blowing anywhere from NW to SW. The water level is on the rise and the current was picking up on the Mississippi River. It was a tough paddle going upstream heading into the wind. There were several times that I was just barely moving forward and actually the wind would blow my canoe sideways further. I took a photo of maybe the last of the snow along this portion of the river. 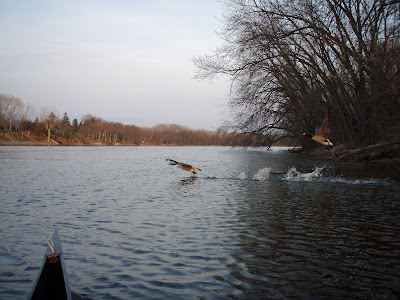 The two eagles were back and we leap frog going upstream. They kept me company, but I really couldn’t get a good photo them. After paddling upstream until 19:22 hours I turned around and took advantage of the strong current for my return paddle. What a joy to be going with the wind and current. I got near the area where I saw three loons on Monday. Guess what I saw today? I counted 12 loons. My return paddle took me only 39 minutes. I was off the water at 2001 hours. Tonight’s paddle was 2:15. I round off to the nearest 5 minutes for my log of the number of hours paddled. Tomorrow, I’ll probably head back to the health club. For the past two months I’ve been lifting weights for muscle endurance. In a week or two I will cut back on my lifting and get more into the cardio (paddling and biking). I put the Prism in after school. 1 1/2 hours up the Yellow River and it only took half an hour to get back down. Plenty of ducks paired up, Cranes and Herons. One imature Bald Eagle on a dead buck, turtles on logs. I heard a Loon yesterday AM during my run. Great time of year. Thanks for the motivation. It was good to be on the water paddling. I'm glad you got out on the water. 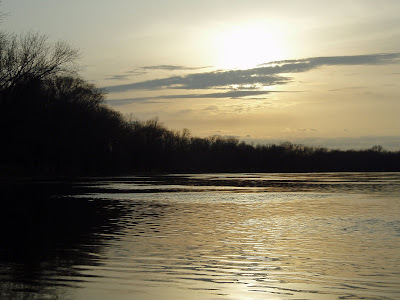 I don't know how big the Yellow River is, I'll have to get out a map; but it's sure nice to get on the water before the boats come out to play. I think the loons I saw want to keep heading north, but the lakes are still covered with ice. Last year I took my Prism out a few times in the spring and took some photos of the birds/ducks/geese with my Nikon D80. 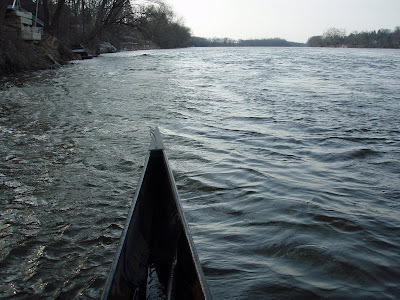 When I'm in my racing canoe I take my Olympus Stylus 770SW.